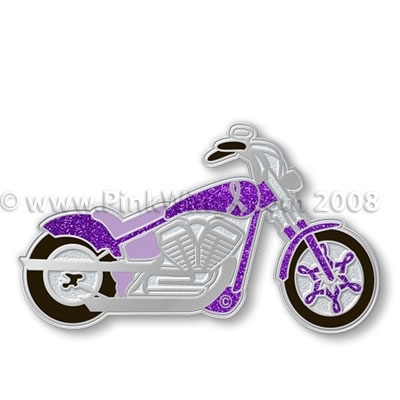 Motorcycle Purple All Cancer Awareness Pin. Back in stock! The purple ribbon represents All Cancer Awareness, Relay for Life, Domestic Violence and Pancreatic Cancer Awareness. What a great pin to show your awareness! Pins are 1 1/2" in length. Pins are in and ready to ship. Order yours today! Please note- these pins are available to order in bulk for your event or organization. 12 pins at $5 each and 100 pins at $4 each. Please email me at czinszer@yahoo.com for discounts on larger numbers of pins.